In 2018, Singapore was ranked as the most important property market in ASEAN by Morgan Stanley’s research. Given this, it is not surprising that Singapore is also home to some of the most expensive properties in the world. But just how nice and expensive can home in Singapore be? Also, how do they compare to the cheapest residences in their neighbourhoods? 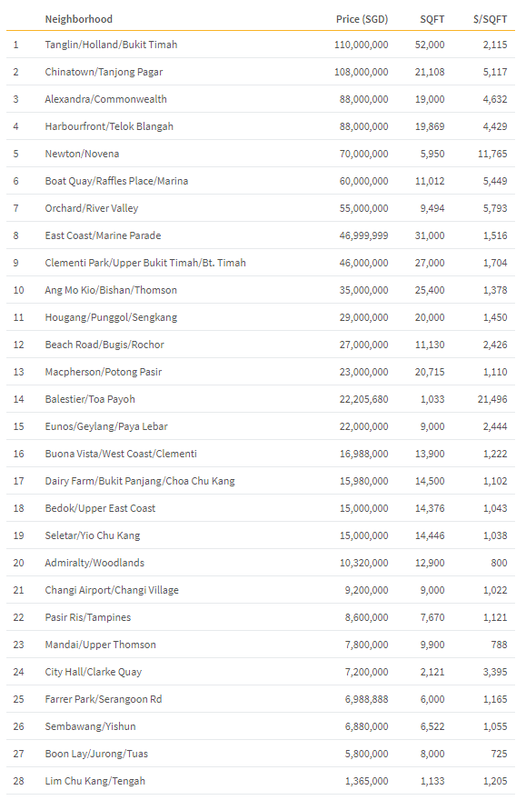 In classic ValuePenguin fashion, we’ve collected the data on the most expensive and the cheapest homes currently listed in Singapore by neighbourhood as of March 2018. 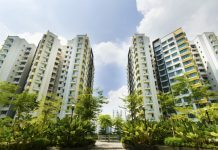 If you are looking to purchase a home in Singapore, our study below might be of value. 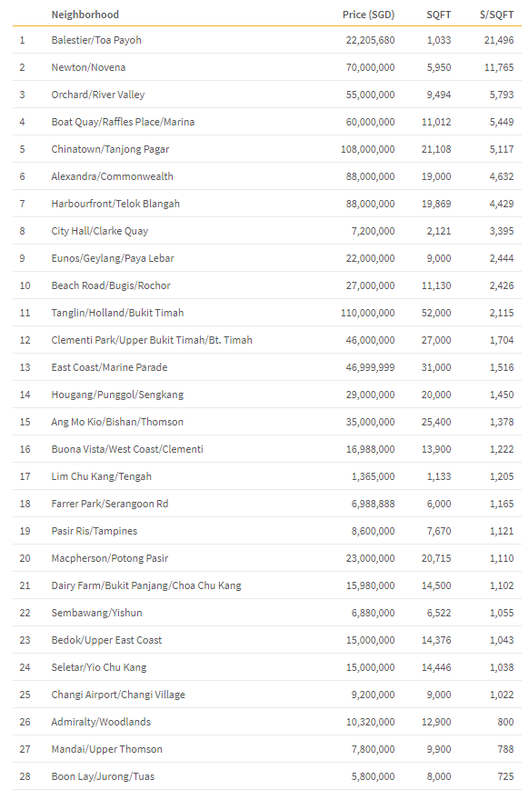 Overall, we found that the most expensive homes in each of the 28 neighborhoods generally ranged from S$1.4 million to S$110 million, a wider range than what we observed in 2017 (S$4.4mn to S$106mn). 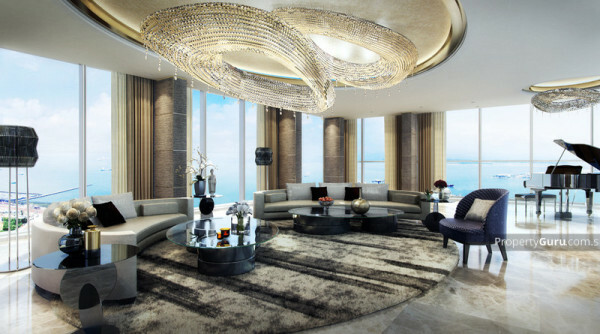 These are ultra-fancy residences that tend to be either landed properties or penthouses of fancy new buildings. In contrast, the cheapest residences typically cost around S$200,000 to S$1.2mn. In terms of price per square foot, expensive homes cost anywhere between S$700/sqft and S$20,000/sqft, with a median of S$1,414/sqft. This was significantly higher than S$350/sqft to S$2,210/sqft we observed for the cheapest properties, whose median was S$477/sqft. Whether you are buying a property that costs S$20mn or one that costs $300,000, you are going to need to take out a loan from a bank to finance your purchase. To find the best deal, you could simply use our study to compare the best home loan rates available in Singapore. On PropertyGuru, the most expensive property currently on sale in Singapore is actually a piece of land in Tanglin/Holland/Bukit Timah area, with listing price of S$11mn and area of 52,000 sqft. 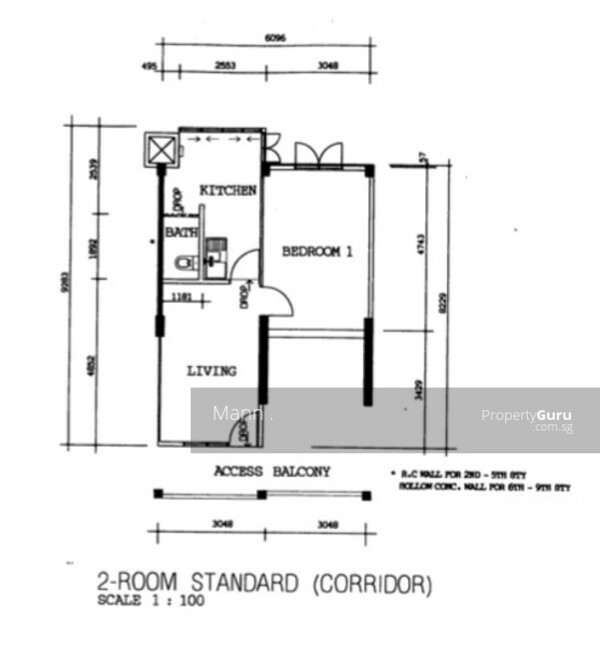 In terms of an actual residential unit, the runner up was located at Wallich Residence in Chinatown/Tanjong Pagar area, with a price tag of S$108mn and a floor size of 21,108 sqft. As you can see, it’s a gigantic apartment in a newly built, high-end condo building. 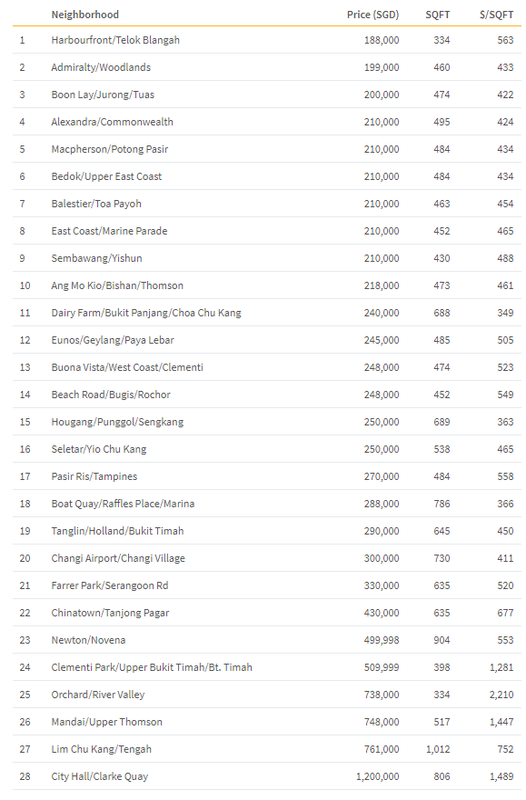 In contrast, two of the cheapest properties were located in Harbourfront/Telok Blangah and Admiralty/Woodlands areas. They were both relatively old and modest HDB flats with price per sqft of around S$500. 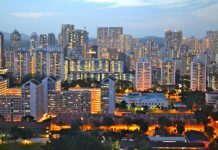 In terms of price per square foot, we found a property located in Balestier/Toa Payoh area with a listed pricing of S$22 million. This unit in Kallang Riverside had a listed land size of 1,033 square foot, resulting in S$21,496 per square foot of unit cost. In contrast, the lowest cost per square foot we found was just S$350, located in Dairy Farm/Bukit Panjang/Choa Chu Kang area. Of course, given the difference in prices, their qualities were vastly different, with one being one of the fanciest properties in the world and the other being a very small, aged and modest HDB flat. We ran a similar study in February of 2017, where we collected prices for the most expensive residences listed in Singapore. 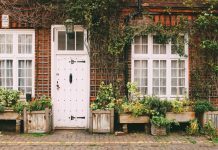 In general, there were very little change in which neighborhoods had the most expensive and the most affordable properties. For instance, 4 of the top 5 neighborhoods that had the most expensive properties on sale in 2017 still ranked as top 5 in 2018. Similarly, 3 of the bottom 5 in 2017 were still ranked as bottom 5 in 2018. We observed the biggest rise in Alexandra/Commonwealth area, who ranked #3 in 2018 compared to ranking #23 in 2017. 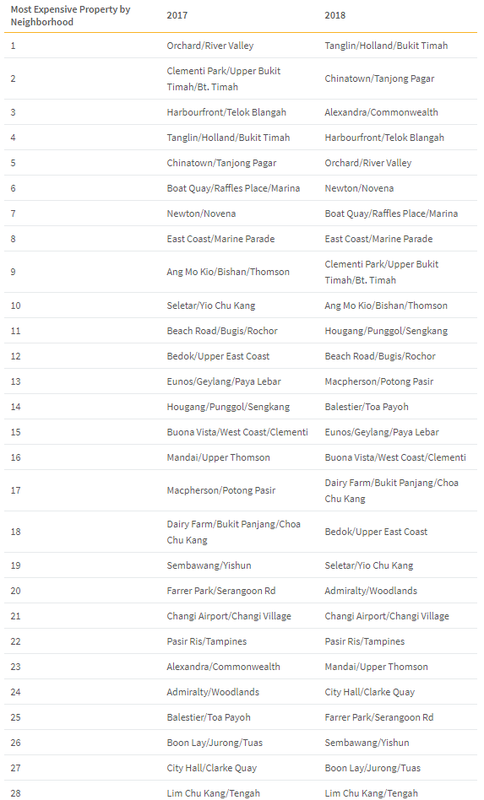 Conversely, we observed the biggest drop in Seletar/Yio Chu Kang area, which ranked #19 in 2018 compared to #10 in 2017. 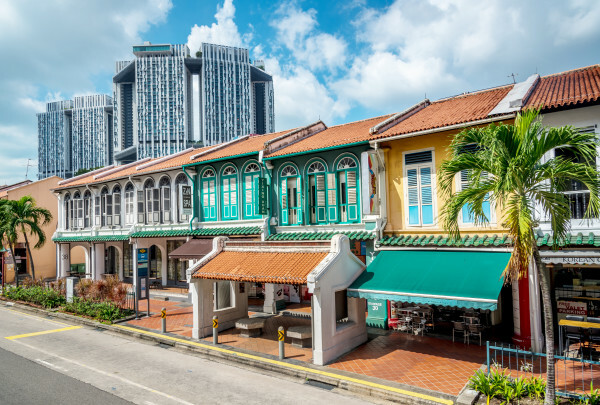 To look for the priciest homes in Singapore, we searched on PropertyGuru for the most expensive and the most affordable homes by neighborhood. We collected data for all 28 districts, and rank ordered properties by 1) total price and 2) by price per square foot. 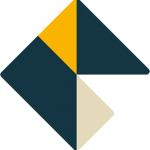 In order to calculate each property’s price per square foot, we divided the total price by either total land size or total property size, whichever was bigger. This was done in order to measure how much surface area an individual ends up owning by purchasing the property. In case of private residences with front and backyards, this would be the total land size. For town homes or villas with multiple floors, on the other hand, this would be the total property size.